SURROUND YOURSELF WITH SOUND, NOT WIRES. Say no to black boxes and complicated wiring. The stylish HEOS AVR revolutionizes the AV receiver, combining wireless surround sound, superb performance and ground-breaking industrial design. The 5.1-channel receiver is ready to drive your favorite speakers and any HEOS wireless speaker as surround channels. Powerful class D amplification encased in cutting-edge design. Now available – control with Amazon Alexa voice commands. Have it all at your fingertips with the intuitive HEOS App. Setup and operation are easy as can be. Just connect the HEOS AVR and your TV with a single cable, get the HEOS App and follow the instructions. Within minutes you're ready to receive. Control all your sound easily via the app, or command the HEOS AVR with the remote of your TV. It couldn't be more convenient. 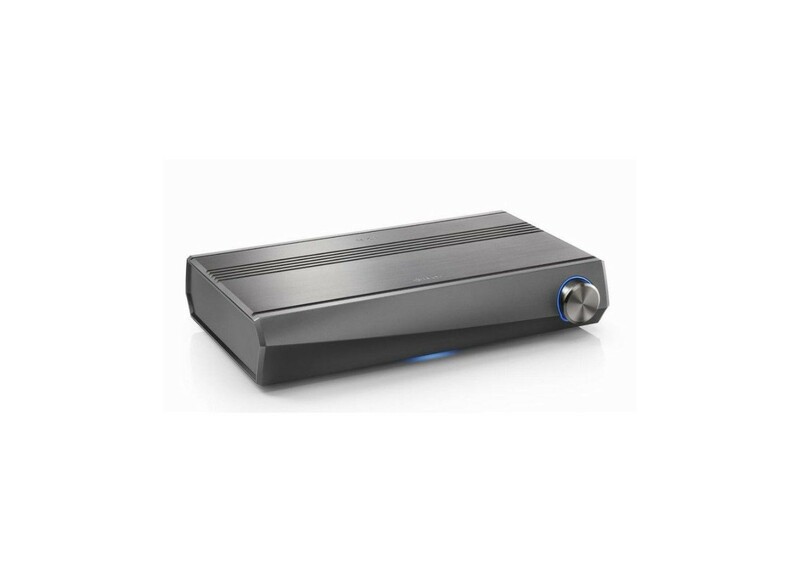 The HEOS AVR has loads of power at its disposal and still sounds sophisticated. Experience stunning virtual surround effects with just two speakers. Get seismic bass by linking the HEOS Subwoofer to the HEOS AVR – without any wiring. MIX AND MATCH FOR DIFFERENT SETUPS. The HEOS AVR drives even demanding speakers in a 2.0 setting for a class-leading sound experience. In combination with the wireless HEOS Subwoofer you can easily create a 2.1 setup to literally shake your world with music and movies. Add a wired center for a 3.1 system to get the clearest dialogues. While with any pair of wireless HEOS speakers, you‘re up for a full cinematic 5.1 surround sound without wires throughout the room. SURROUND YOURSELF WITH 5.1 CINEMA SOUND. Add any pair of wireless HEOS speakers and get the sensation of being in the middle of every movie. With the easy-to-use remote control of the HEOS AVR you have the main functions always ready at hand. Additionally, it offers instant access to 6 audio presets, so you can choose between optimized settings for different music or movie scenarios. GET THE AMAZING HEOS EXPERIENCE. Connect any HEOS device you like and fill your home with sound, not wires. Stream all your music to any room or the same music to all rooms using your home network. Share tunes from your smartphone via Bluetooth. Have it all at your fingertips with the intuitive HEOS app. The HEOS AVR is not only a top-notch home entertainment component, it is a design statement. Its aluminum chassis is unparalleled in the world of AV receivers. No doubt, that the HEOS AVR is also completely future-proof with the latest HDMI standards. Four HDMI 2.0a/HDCP 2.2 inputs make sure that you can enjoy your movies in 4K Ultra HD. Regarding sound, you can count on Dolby TrueHD, DTS-HD Master Audio. SHARE YOUR FAVORITE TUNES ANYWHERE YOU LIKE. Play your personal music collection throughout the whole HEOS ecosystem. Even in high-resolution. The HEOS AVR supports all major streaming formats. Control the music in every room with the HEOS App. All the great music services are fully integrated. Set the mood that's just right for the moment. Every room can have its own HEOS sound. Or, group multiple speakers to fill the house with the same song. Multi-room means multiple options. Cloud music, streaming music and your music library—all your favorite sources are supported by this amazing FREE app. It’s no accident that HEOS speakers produce pristine sound. They are engineered by the experts at Denon, innovators in audio for more than 100 years. It’s amazing how quickly you can start listening to your HEOS speakers. Place your speakers, and you will be listening to music in minutes. It’s really that simple. Use your voice to stream your favorite music services to this HEOS-enabled device. Ask Alexa to play music from Pandora, Spotify, Amazon Music and much more. Switch between inputs (Blu-ray, DVD, Media Player, etc. ), turn volume up or down, pause, mute and play the next song — all with your voice. To start streaming with Alexa voice commands, open the Alexa app and select “Skills.” Add HEOS Home Entertainment to enable. Then, go to Smart Home in the Alexa app menu and choose Devices and Discover or say “Alexa, discover my devices.” With HEOS Home Entertainment and Alexa, you can stream to this product and any other HEOS-enabled device. Play music from Pandora, iHeart Radio, Amazon Music Unlimited, Tidal, Napster, Spotify, Deezer and SiriusXM. All you have to do is ask. Combines up to 5.1 ch class-leading surround sound with the ease-of-use of a soundbar. 5x 100 W powerful class D amplification capable to drive your favorite speakers. Wireless surround channels using any pair of HEOS speakers. Beautiful industrial design with aluminum chassis. Latest HDMI and 4K UltraHD compatibility with 4 HDMI inputs. 6 Quick Selects for favorite functions and radio stations. Built-in HEOS network technology for access to the most important online streaming services, and stunning multiroom experience with other HEOS products. Dolby TrueHD, DTS-HD Master Audio for the best multichannel sound quality. Control basic functions of the HEOS AVR with your television.